US State Department spokesperson Marie Harf refused to directly acknowledge Kiev’s role in violating the Minsk peace agreements in eastern Ukraine, turning a blind eye on daily OSCE reports that equally implicate the government and the rebel forces. The video below shows RT’s Gayane Chichakyan grilling Harf – and failing to get a straight answer on the issue despite multiple attempts. Chichakyan reminds Harf about the daily reports compiled by the Organization for Security and Co-operation in Europe (OSCE) listing violations, noting that the breaches are more or less equally split between both sides of the conflict. Harf continues to insist that the “majority of violations” to the Minsk agreements have been committed by rebel forces and not Ukrainian troops. Over the past two months, the OSCE has blamed the Donetsk and Lugansk forces for nine violations of the ceasefire, while accusing the Ukrainian government of another eight. Chichakyan added that there were only 33 reports regarding rebel violations of the requirement for heavy weapons withdrawal under the Minsk agreements, compared to 35 reported violations by Ukrainian troops. “This is hardly a vast majority behind that. Question: where do you – and I mean the State Department – get the information that the rebel forces are responsible for the vast majority of violations?” Chichakyan asked. Gayane Chichakyan: A simple question. Do you acknowledge that the Ukrainian government too is violating the Minsk agreements? GC: That is not clear from the OSCE daily reports. GC: That was not my question. It’s a simple yes or no question. GC: Do you acknowledge that the Ukrainian government too is violating the Minsk agreements? Yes or no? MH: We don’t do yes or no here, I think I just answered your question, when I said if a large majority is the Russian separatist forces then there is a very small minority that is on the other side, I think that answers your question. MH: I’m not going to say yes or no. I’m going to answer the question in the way I think is appropriate, and I just did. AP’s Matt Lee had a similar conversation with State Department spokesman Jeff Rathke last week. Rathke was asked to comment on the use of heavy artillery in residential areas in eastern Ukraine. “The overwhelming majority of the ceasefire violations have been conducted by combined Russian-separatist forces attacking Ukrainian positions on the Ukrainian side of the line of contact, which is clearly contrary to the Minsk agreements,” Rathke stressed citing those same OSCE reports. When Lee pressed on, clarifying that some of those reports mention Kiev forces violating the Minsk peace agreement, Rathke refused to acknowledge just that, stating that he has not seen these kinds of reports. “I really don’t have anything to add beyond my statement earlier, that the overwhelming number of violations are coming from the Russian separatist side in eastern Ukraine,” Rathke told Lee. Russia has repeatedly denied accusations of providing arms to the Ukrainian rebels or sending troops to fight in the civil war. Moscow maintains that Washington is using the Ukrainian conflict to pursue its own geopolitical goals and isolate Russia. The Minsk peace agreements were signed in September 2014 and February 2015 by Ukraine, Russia, Germany and France in the Belarusian capital of Minsk. They list required steps intended to bring peace to conflict-torn eastern Ukraine, including a ceasefire, the withdrawal of heavy weapons, and a constitutional reform decentralizing power for Ukrainian regions. 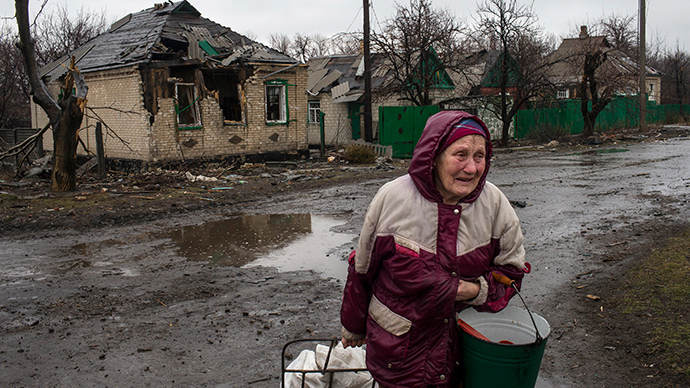 Meanwhile, the situation in eastern Ukraine has intensified. The latest incident was a shelling in Donetsk overnight on Wednesday. Nineteen people, both civilians and militiamen, were killed and over a hundred injured in the bombardment, according to local officials. Government and rebel forces have been trading accusations with regard to which side opened fire first. The Donetsk People’s Republic’s (DNR) blames Kiev for “provoking” its troops, while Kiev denies the claim. Another six civilians had been killed earlier in the day in the city’s south-west districts, while another 90 were injured, Donetsk’s mayor, Igor Martynov, said. Last week, three civilians, including a child, were reportedly killed in the town of Gorlovka after a shell fired by the Ukrainian military hit a residential area.